Skills and Abilities: Nighthawk is extensively trained in unarmed combat and a variety of martial arts forms. He is a genius level inventor and strategist as well. Powers: None. He uses a variety of technology based gadgets and vehicles to assist him in combat. A sudden and random hate crime robbed youngkyle Richmond and his parents and forever changed his outlook on life. After his parents were gunned down by white supremacists, Kyle vowed to have revenge. Inspired by his father’s last words,kyle took on the mantle of theNighthawk, a predatory creature of the night that strikes from the shadows. Though only human, Nighthawk is a well-trained and cunning warrior. His vast wealth and relentless obsession to vigilante justice have provided him with the necessary tools to strike fear into the hearts of criminals everywhere [Squadron Supreme Saga (2006)]. Sometime prior to Hyperion’s chicago visit, Nighthawk was inundated with serial killings of an escaped convict named Steven Binst, who the media dubbed “Witeface”. The Killer, a former pharmacist, infected the city’s illegal drug supply and sent countless users to their graves. 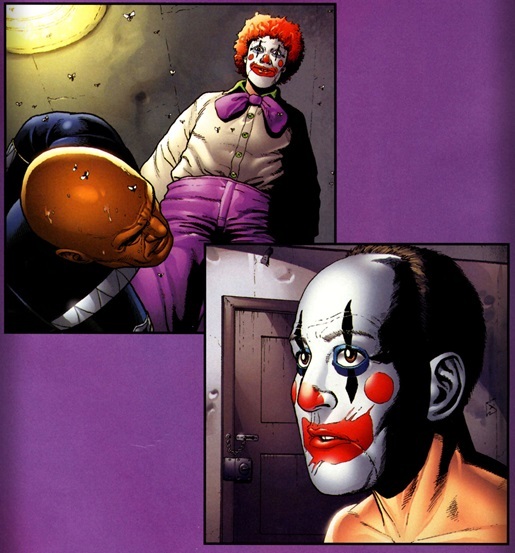 WhileNighthawk attempted to track the supply back toWhiteface, the killer disguised himself as a party clown and fatally gassed the Mayor’s child and all their guests at a birthday party. B the time Nighthawk finally confronted him, the killer had contained, stabbed and shot his way across town. He had also claimed the life of Doctor Arredondo – a friend of Nighthawk’s-and kidnapped a young black infant the vigilante had previously rescued when it’s mother perished from whiteface’s poisoned cocaine. Squaring off in a water treatment plant, whiteface spoke of how he and nighthawk were opposite sides of the same coin- psychotic misfits that needed each other. Nighthawk disagreed. After disemboweling his foe, the crime fighter snapped the killer’s neck and watched him drown in a filthy sea of untreated sewage. 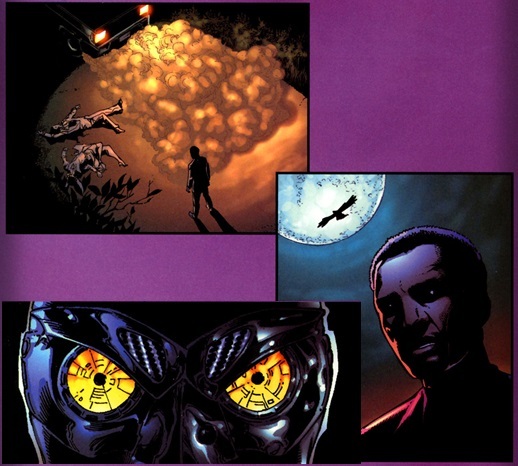 He then took the infant child he had now rescued for the second time and vanished in the night [Supreme Power: Nighthawk 1-6 and Squadron Supreme Saga (2006)]. Later he joins with Hyperion and Blur to stop a super human serial killer who preys on prostitutes. In the end the killer is taken into custody and he parts on bad terms with both heroes. Later he turns down a spot on the squadron Supreme super team. After the Infinity event Nighthawk and the Squadron Supreme confront the Cabal of Earth 616. In the ensuing battle all were seemingly killed and their earth destroyed so Earth 616 could survive the incursion [New Avengers #24]. Nighthawk survived however. After Secret Wars Nighthawk and other Incursion survivors band together to form a New Squadron Supreme to protect the New Marvel universe by any means necessary and also to take down the many Avengers if need be. Does anybody notice that his story sounds A LOT like Batmans story? I was thinking the exact same thing, and Whiteface seems like his Joker. Okay in response to these comments made years ago: Squadron Supreme (and the later Supreme Power) is the Marvel version of the Justice League, created to explore how such characters would be seen in a mature, “real world” setting. Hyperion is Superman, Blur is the Flash, Zarda is Wonder Woman and so forth. This concept was again used by DC when it gained the rights to the Charleston Comics characters who were then altered a bit in a story by Alan Moore you might have read. It’s called Watchmen.